Despite misty conditions, a handful of skiers and snowboarders hit the trails on March 28 at Sunday River in Newry. 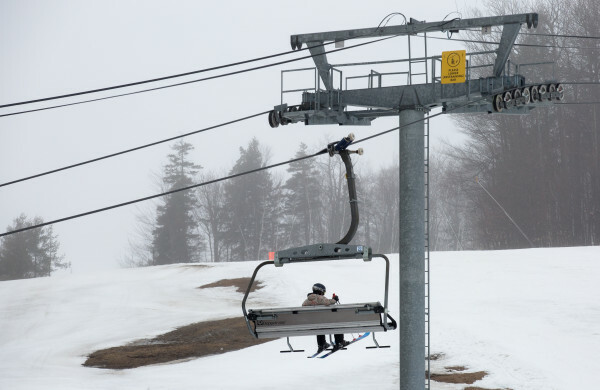 Ski racks sit empty and dripping with rain on March 28 at Sunday River in Newry. 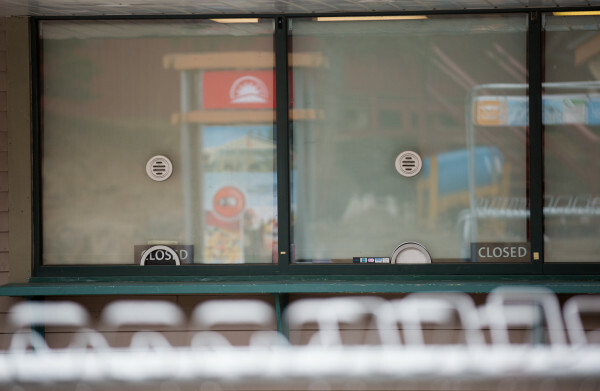 Ticket counters stand closed on a rainy Monday at Sunday River in Newry. Despite misty conditions, a handful of skiers and snowboarders hit the trails on Monday at Sunday River in Newry. 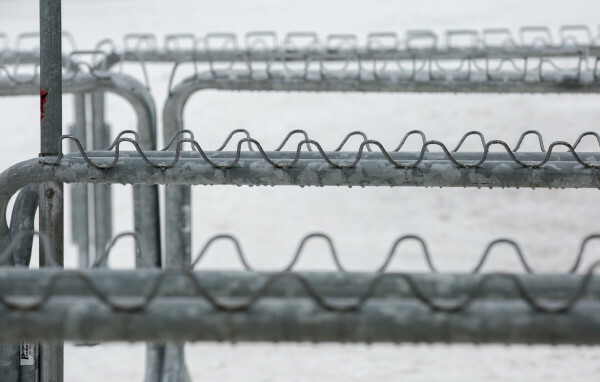 PORTLAND, Maine — The largely absentee winter dealt a blow to cold-weather recreation businesses in parts of the state, but the hurt wasn’t distributed evenly. At Sunday River in Newry, ski traffic was off by about 15 percent of a five-year average through early March, despite snowmaking there and at sister resort Sugarloaf that kept further losses at bay. Meanwhile, conditions that made it tougher to keep snow on the ground in western Maine gave destinations north a boost in the latter half of the season, according to Jean Willette, owner of Martin’s Motel in Madawaska. Willette said faces new and old returned to The County this winter, some snowmobilers who she estimated hadn’t been back in more than a decade. As is the case with ski resorts, she said social media “had a big part to play” in showing snow on trails while it may not have been plentiful in backyards for potential snow-goers to see. Lingering low gas prices, she said, likely factored into people’s willingness to make the trip during the El Nino year. Mark Bloomer, a meteorologist with the National Weather Service, said that through March, Caribou was about 20 inches below its average annual snowfall, typically about 100 inches. The January average temperature was about 7.5 degrees above normal. There’s no perfect measure of the economic impact of that warmer weather on winter tourism, but parts of the state that take in the largest share of annual lodging revenue during the winter months posted lodging declines of about 6.5 percent for December and January. Grouped as economic statistical areas, which include multiple communities, those in the northernmost part of the state saw the slightest drop, according to a Bangor Daily News analysis. The group includes the top half of those areas, ranked by the share of annual lodging revenue taken in during the winter months. Those figures capture other types of travel and economic factors as well. For instance, in the larger Penobscot grouping of economic summary areas, towns around the shuttered Lincoln paper and tissue mill reported a 41 percent drop in December and January lodging revenue, compared with one year ago. The opposite appears to be the case in Madawaska, where Willette said she has had steady weekly traffic through the winter from construction workers going to the Twin Rivers mill. And she expects things will get better for tourism. March weekend bookings mostly have been snowmobile traffic, she said. While fishing derbies and other events brought in traffic in February, Willette said, the unseasonably warm weather caused cancellations elsewhere in the state, from cross-country ski events to ice fishing derbies. George Smith, an outdoors writer, said during a Natural Resources Council of Maine news conference in mid-March that the winter was especially difficult for sporting camps and outdoor retailers near snowmobile and ice fishing destinations. In the state’s biggest city, Chris Carleton, owner of the ski and bike shop Allspeed Cyclery and Snow, said sales and repair work was down by about 25 percent this season. Todd Martin, an organizer for the Natural Resources Council of Maine, said that it’s hard to sort out on a year-to-year basis how much of that low snowfall and warm weather is attributable to the El Nino weather pattern and how much to long-term warming. On top of that, he said, rainy days forced snowmaking to focus more time on resurfacing runs rather than opening new terrain. Bill Brown, the snowmaking and energy adviser for Sunday River, said in legislative testimony that this year has been tough for mountains of all sizes, noting that Saddleback in Rangeley delayed reopening plans amid sale negotiations. The weather this year has put a dent in revenues for Sunday River and Sugarloaf, both of which are owned by the real estate investment trust CNL Lifestyle Properties and managed by Boyne Resorts. The opposite was true last winter, the company said. 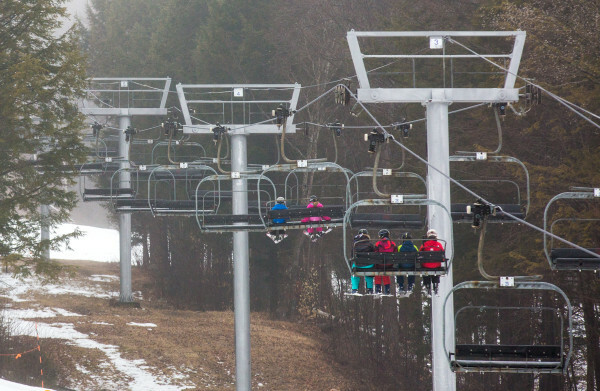 Looking back on the rough ski season so far, Greg Sweetser, executive director of the industry group Ski Maine said snowmaking was a saving grace, despite what he expects will be a compressed season and what was a particularly rough year for cross-country ski areas. “You just can’t replace the aura of a nice snowy field and the snow on the trees,” he said. Lambert said Sunday River still expects to stay open seven days per week through mid-April, cutting back to weekends only through May 1.